Please note: This website is an archive of ghscc.com. It is no longer updated. Written by Alan Hogan on 2005-01-27; viewed 73495 times. Last revised: 2009-04-09 by Alan Hogan. See all. 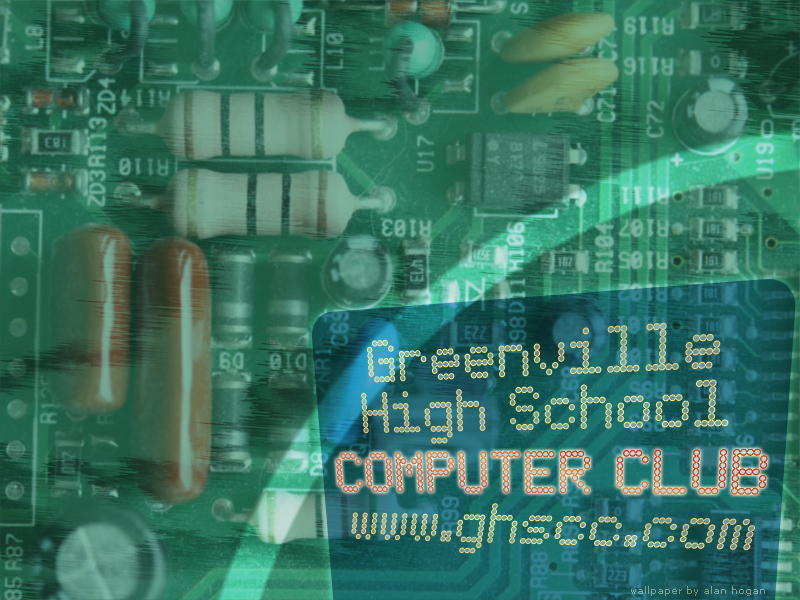 The Greenville High School Computer Club is comprised of students at GHS (in Greenville, Pennsylvania) and our advisor, Mr. Myers. As a club, we put out newsletters for students and teachers to read. The newsletters discuss current technology news, club happenings, and the latest and greatest technological gizmos and gadgets. You can be e-mailed whenever a new issue of the club newsletter comes out. Sign up for the alerts here! Try on some GHSCC desktop wallpaper: Check out v1.8.0 and let Alan know what you think. Mozilla Firefox is continuing to obtain new users. Getting Firefox may help you fight spyware, but that’s not all. Find out more about Firefox, or download it from getfirefox.com. Also consider Opera or Safari. Our website has a question-and-answer page. We’ll try to answer any computer or technology-related question submitted. Be one of the first to have your question answered and posted online! Skins change our site’s look & feel. Site contents © 2005 Greenville High School Computer Club (GHSCC) and contributing members. This page is automatically printer-friendly. Just click your Print button!